Warner Archive recently released two seafaring adventures starring John Wayne on Blu-ray. 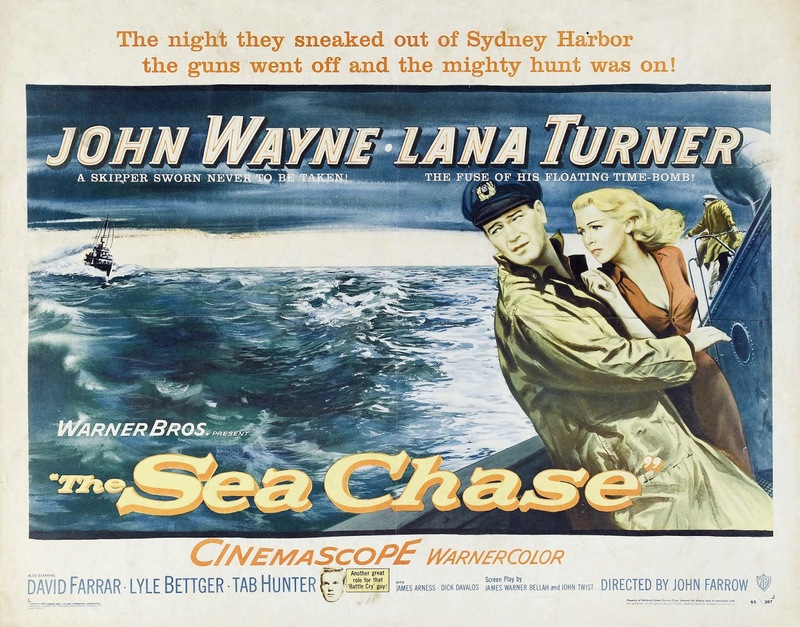 The photo above shows the Duke with Lana Turner in The Sea Chase (1955). 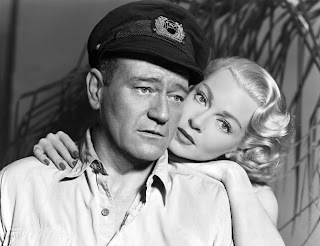 Old Hollywood icon John Wayne is best known for playing cowboys and World War II heroes, but, from time to time, the Duke did abandon his landlubber ways to sail the ocean blue (in real life, Wayne was an avid amateur sailor). 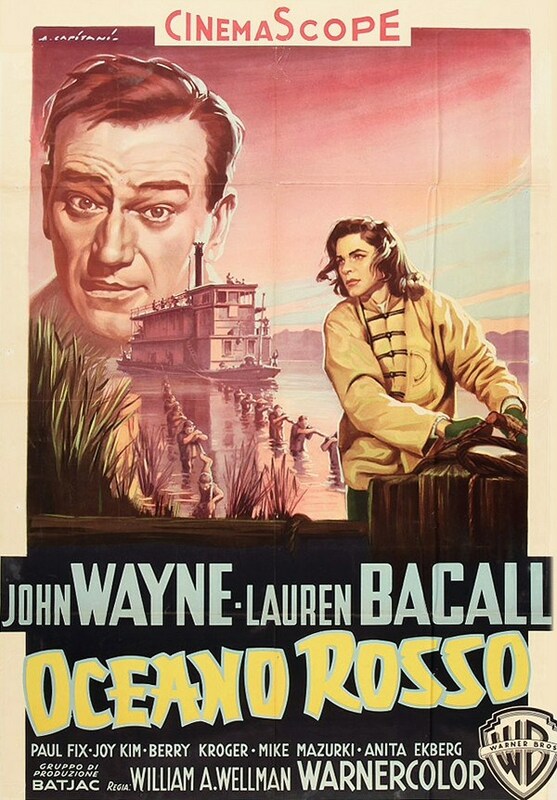 If you're eager to catch up with Wayne's swashbuckling side, the good folks at Warner Archive recently released on Blu-ray two 1955 seafaring adventures that feature Wayne as the hard-nosed captain of two very unusual vessels (click on the title to learn more about the Blu-ray). The Cast: Wayne; Lana Turner; David Farrar; Lyle Bettger; Tab Hunter; James Arness, and John Qualen. The Plot: In the tense days before the start of World War II, German freighter captain and vocal opponent of Adolf Hitler Karl Ehrlich (Wayne) is hoping to set out the war in a Sydney harbor. However, when the Nazis order Ehrlich to take a beautiful spy (Turner) back to her homeland, the tough-as-nails seaman has little choice but to embark on a dangerous voyage that will find him dodging the British Navy and sailing halfway around the world. Backstory: The Sea Chase is based on a real incident in World War II that was later turned into a 1949 novel by Andrew Geer (the real German freighter only made it to the coast of Uruguay before being picked up by the British Navy). The Warner Bros. production was filmed on location in Hawaii, and the shooting was often arduous and difficult, especially for leading lady Turner, who often crumbled under the demands of location shooting, and Wayne, who caught a serious ear infection. 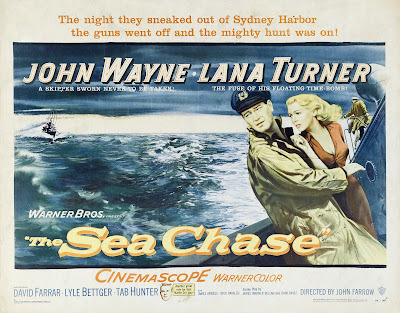 Although it was dismissed by critics, The Sea Chase was a moderate box office success. 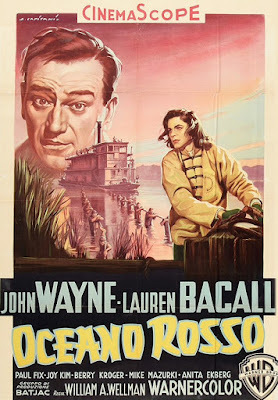 Pros: The beautiful location shooting in Hawaii; The exciting chase sequences; the great supporting cast, especially Arness and Hunter as a rebellious crewmen and Qualen as a stalwart engineer. Cons: Much of the plot is nonsensical -- I could never really figure out exactly why Ehrlich is determined to sail all the way to Norway; there's no upside for either he or his crew since they are opposed to the Nazis -- and neither Farrow nor Wayne can decide whether to portray Ehrlich as a noble hero or as a Captain Ahab type who is driving his crew beyond the breaking point. Also, Wayne and Turner have zero chemistry. This one is for: Wayne fans. The Duke is always worth watching when he's large and in charge, and his performance as the obsessive Ehrlich gives interesting glimpses into his masterful work in director John Ford's masterpiece, The Searchers (1956). The Cast: Wayne; Lauren Bacall; Paul Fix; Mike Mazurki; Joy Kim, and Henry Nakamura. The Plot: Merchant Marine Tom Wilder (Wayne) is going stir crazy in a Chinese prison when he is suddenly given a Russian army officer uniform and told to escape with the help of a man named Big Han (Mazurki). As it turns out, the residents of a small village and the daughter of an American doctor (Bacall) want the tough-as-nails seaman to pilot a ferry through the dangerous Taiwan Strait, aka Blood Alley, so they can escape the cruelties of the Communist government. Backstory: Robert Mitchum was originally slated to star alongside Bacall, but, after the hard-partying star showed up drunk and disorderly one too many times, director William Wellman canned him. The role of Wilder was offered to Gregory Peck and Humphrey Bogart, but both actors gave a firm "no thanks" to the project so Wayne cut short his honeymoon to third wife Pilar to take the helm of his second seafaring adventure in a row. The movie did not do well at the box office, barely recouping its $2 million production costs. Pros: In my opinion, Blood Alley is a much-better film than The Sea Chase because of the assured direction of the legendary Wellman. "Wild Bill," as he was known in Hollywood, knew his way around an action movie, and, in the film's final half, he crafts a seafaring journey of nail-biting suspense. Cons: The stereotypical treatment of the Chinese characters and the casting of non-Asian actors in Chinese roles (although, in fairness, both Mazurki and Fix are excellent). This one is for: Both Wayne and Bacall fans. The Duke has a great time playing a slightly kooky character -- Wilder has an imaginary girlfriend named Baby with whom he often converses and Wayne's hammy theatrics while piloting the ferry through stormy waters are hilarious. Bacall looks absolutely sensational in a series of chic outfits and, surprisingly, she and Wayne are a fine screen team. "Powder your nose, Baby, we're coming into Hong Kong!" One of the Duke's best lines!